Cochlear implant is a medical device that is implanted into the head behind the ear of a person suffering from hearing loss. Cochlear is a credible hearing loss treatment which is effective for mild to profound hearing loss. If you are suffering from hearing loss and unsure whether or not cochlear is a good option for you, you can contact us for a hearing test in Templestowe, which will help us determine whether cochlear implants or any of the other hearing aid devices will be appropriate for you. We have a variety of hearing aid devices available and we help you pick the most appropriate one, according to the nature of your hearing loss. Many people give in to the temptation of purchasing hearing aids on the internet without knowing much about their hearing loss which doesn't benefit them much. 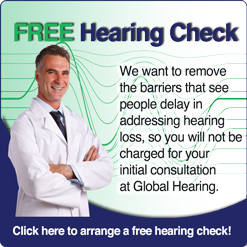 Our clinic is accredited by the office of hearing loss and a one stop destination for people suffering with hearing loss as Global hearing is an integral part of Care family Practice. We can supply free hearing aids to veterans, eligible for OHS scheme. Our Audiologist will perform a comprehensive hearing test before commencing hearing loss treatment as it is important to know the cause and type of your hearing loss.